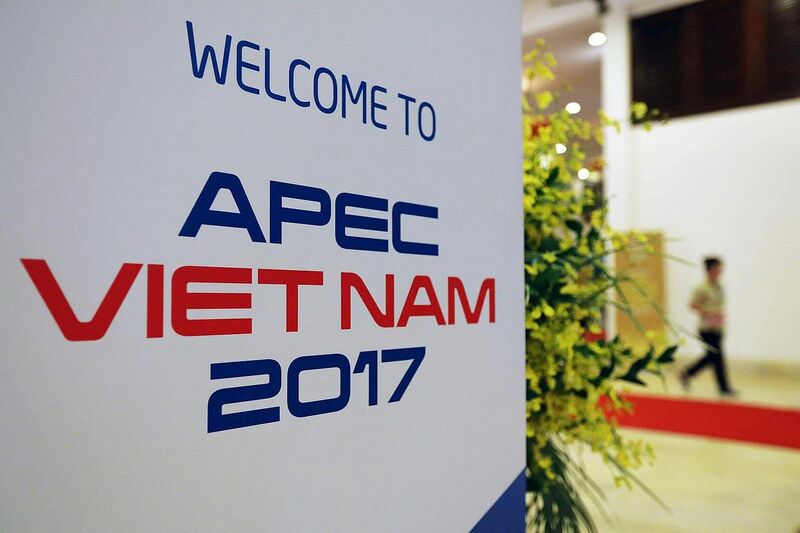 The 25th anniversary Asia-Pacific Economic Cooperation (Apec) Economic Leaders' Meeting will take place in Danang tomorrow and Saturday. We greatly value the Apec forum for the ample opportunities it affords all participants to engage in discussions and coordinate positions on a variety of economic, social, environmental and cultural issues. Our countries strive to cooperate based on the principles of consensus and voluntary participation, mutual respect and willingness to compromise, regardless of the political situation. This is what Apec's unique spirit of partnership is all about. We support the idea of forming an Asia-Pacific free trade area. We believe this is in our practical interest and represents an opportunity to strengthen our positions in the rapidly growing Asia-Pacific region (APR) markets. I want to note that over the past five years, the share of Apec economies in Russia's foreign trade has increased from 23 per cent to 31 per cent, and from 17 per cent to 24 per cent in exports. And we have no intention of stopping there. Of course, the large-scale project to create the Apec free trade area should be carried out with due account of the experience gained from implementing key integration formats in the APR and Eurasia, including the Eurasian Economic Union (EAEU), in which Russia cooperates with Armenia, Belarus, Kazakhstan and Kyrgyzstan. Our union has been developing dynamically, and we are eager to build relations with all countries and associations that are interested in doing so. Vietnam, the host of this year's forum, was the first state to sign a free trade agreement with the EAEU. As a result, our trade grew significantly and became more diversified. Talks on a trade and economic cooperation agreement with China concluded a short while ago. Talks with Singapore have begun, and we are working on the possibility of signing a free trade agreement with Asean. On a related note, I would like to mention our idea to create the Greater Eurasian Partnership. We suggested forming it on the basis of the EAEU and China's Belt and Road initiative. To reiterate, this is a flexible modern project open to other participants. Comprehensive development of infrastructure, including transport, telecommunications and energy, will serve as the basis for effective integration. Today, Russia is actively modernising its sea and air ports in the Russian far east, developing transcontinental rail routes, and building new gas and oil pipelines. We are committed to implementing bilateral and multilateral infrastructure projects, which will link our economies and markets. Among other projects, I am referring to the Energy Super Ring that unites Russia, China, Japan and the Republic of Korea, and the Sakhalin-Hokkaido transport link. We pay special attention to integrating Russia's Siberian and far eastern territories into the network of APR economic ties. These efforts include a whole range of measures to enhance the investment appeal of our regions, and to integrate Russian enterprises into international production chains. We have an equally serious approach to involving small and medium-sized businesses in Apec economic integration processes, and supporting female entrepreneurship and start-up companies run by young entrepreneurs. Of course, we attach special importance to strengthening our cultural ties and expanding our contacts in the spheres of science and education. Looking ahead, we will focus on forming a common APR education space, one of whose centres could be the Far Eastern Federal University. We believe that establishing effective cooperation to support innovation is the most important task we face in this dynamic era. As such, Russia has put forward a number of specific initiatives. These include unifying digital economy and trade rules, harmonising national technical standards, coordinating strategies for forming high-tech markets, and creating a uniform conceptual framework for the digital space. We have also shared with our partners our experience in providing e-services to the public. In addition, we suggest starting consultations within Apec on international information security and protection of computer software. Preventing and providing relief following natural disasters and man-made accidents, epidemics and pandemics is another challenge that requires a joint response by all APR partners. Of course, we need to tackle food security issues together and think about how to meet the region's rapidly growing demand for high-quality and healthy food. Russia is one of the world's leaders in exports of grain, vegetable oils, fish and a number of other foods. We expect to become the leading supplier of ecologically clean food to our neighbours in the Asia-Pacific region. To do so, we are taking measures to increase agricultural output and improve productivity. We intend to engage in substantive discussions of all these topics during the upcoming summit in Danang. I am confident that, acting together, we will find acceptable solutions to the challenge of supporting the steady, balanced and harmonious growth of our shared region, and securing its prosperity. Russia is ready for such a collaborative effort. • The writer is the President of Russia.